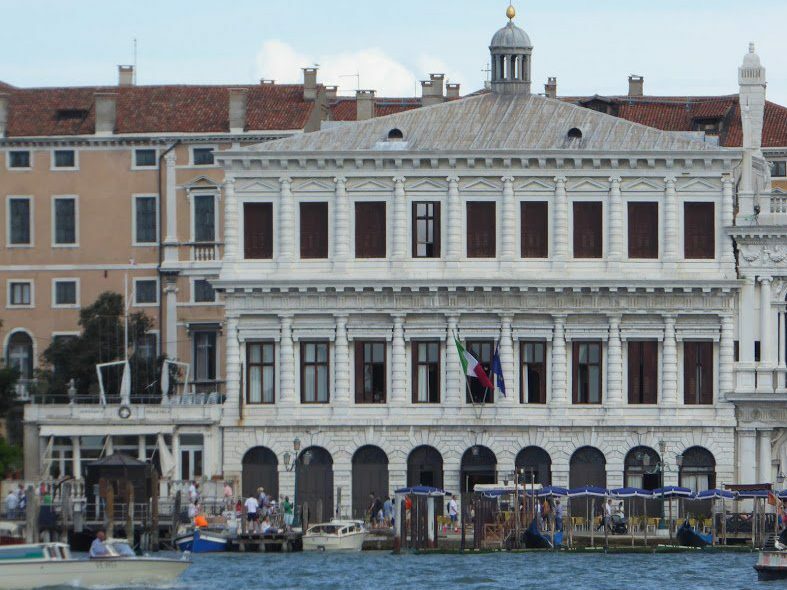 Everyone has heard of the city of Venice, with its iconic canals, towering campanile, Doge’s Palace and Basilica of St. Mark, but there’s much more to the architectural patrimony Venice provided us than just those landmarks. Yes, the Bissell Water Tower up in College Hill shows the distinct influence of a Venetian bell tower, but don’t forget the debt the grand mansions of Compton Heights and the Central West End owe to Jacopo Sansovino and Andrea Palladio. 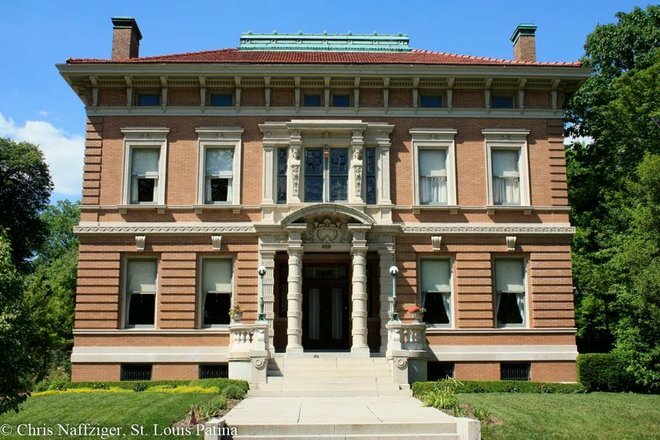 These two architects, the former a Florentine immigrant, the latter a native-born Venetian citizen, left a legacy that lives on throughout St. Louis. First, a little background is in order. Venice is the youngest major city in Italy, founded by refugees from the mainland during the collapse of the Roman Empire. They deduced, correctly, that living out in the middle of a saltwater lagoon would provide significant protection from attack, as citizens survived off rainwater collected in basins. The city grew rapidly through the Middle Ages because of its strong economic and cultural ties to the Byzantine Empire. St. Mark’s Basilica, the giant cathedral of Venice, was inspired, for example, by the now-lost Church of the Holy Apostles in Constantinople. Most important for our story, Venice was a peaceful city-state—La Serenissima—ruled by an elected leader known as the Doge, and consequently, architecture did not need to take on the fortified appearance of palaces in Florence (Firenze) and other less politically stable Italian cities. Florentine Jacopo Sansovino moved to Venice in the early 16th century, having trained as a sculptor and visited Rome during the High Renaissance, when Donato Bramante was working on St. Peter’s Basilica. Sansovino grew close to several important figures of the Venetian Renaissance, including the highly influential painter Titian and the author Pietro Aretino. Known as the Triumvirate, the three friends were famous for their nighttime revelry. 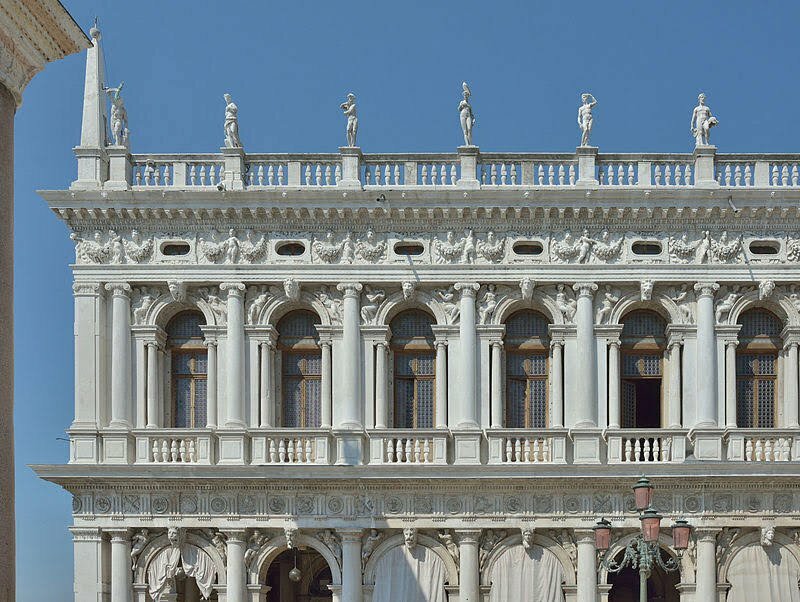 Thanks to the political stability of Venice, Sansovino’s commission for a new mint building, the Zecca, allowed the sculptor-architect to take new liberties in its design. Much as Michelozzo had done in the Palazzo Medici-Riccardi in 15th-century Florence, Sansovino used heavier rusticated blocks on the first floor, then gradually refined the stonework on the second and third floors. Thus the Zecca becomes lighter and airier as it rises from the Grand Canal. Likewise, the first floor is punctuated by arched entrances, while the upper floors have pedimented lintels. The overall effect is one of openness and stability. Meanwhile, the slightly younger Andrea Palladio—a native of Padua, a city on the mainland that was ruled by Venice—was developing his own style for the wealthy landowners who farmed the vast open plains of the Veneto. Logically, very few crops could be grown out in the lagoon of Venice, so the Republic had long controlled vast swaths of the fertile lands along the Po River north of the Apennine Mountains. Those wealthy Venetian landowners needed country homes, called villas, in which to live when they visited, and Palladio would invent the modern-day suburban home in response. 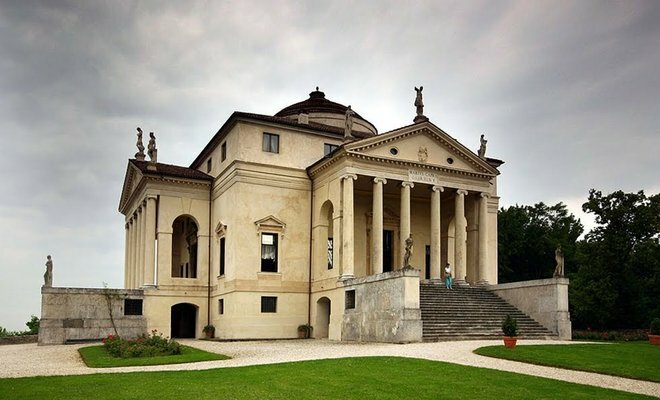 Perhaps the most famous example is the Villa Rotonda at Vicenza, which shows the influence of ancient Roman architecture (as does pretty much all Renaissance architecture). The villa house is a centrally planned building, with long staircases leading up to four identical temple façades. The actual interior of the house is relatively small, though it is crowned with a dome reminiscent of the ancient Pantheon in Rome. Freed from the constraints of Italy’s typical crowded, compact building sites, Palladio could design a house that communes with nature from all sides. English architects would embrace the Venetian’s designs, giving rise to a style of architecture known as Palladianism. Monticello, designed by Thomas Jefferson, is perhaps the most famous example in America. Interestingly, in our own postmodern age, Palladio is influencing the built environment of American suburbia perhaps more than he would have desired. Any McMansion that sports a Tuscan or Ionic column most likely is copying Palladio, though I would argue that the Renaissance architect’s lesson is lost without the accompanying understanding of balance and harmony. Western architecture is successful when proportions and symmetry are correct, not when an architect wields a Tuscan column ignorantly. This raises a larger issue: An architect of the magnitude of Palladio cannot control his legacy after his death, for better or for worse.